Whether you call it the oval office, loo, Potty or toilet, we can all agree that shopping for a toilet isn’t anybody’s idea of fun. They all look the same which presents it extremely hard to compare different models. Nonetheless, they are very important. No office or home can be complete without an exquisite bathroom. Now, with proper research and care, you will find a model that will not only suit your home well but also last for decades. That notwithstanding, there are hundreds of reasons why choosing the right toilet for your needs can be a hard nut to crack. For example, the number of toilet types, as well as brands available, can be overwhelming for any first-time shopper. What’s more, there are hundreds of flushing methods that offer varied levels of performance and water consumption which can be fairly confusing. As such, this guide looks at the best one piece toilets to help you in your search. Hopefully, it will provide you with insights into what to expect from each design and make your purchasing decision as flawless as possible. 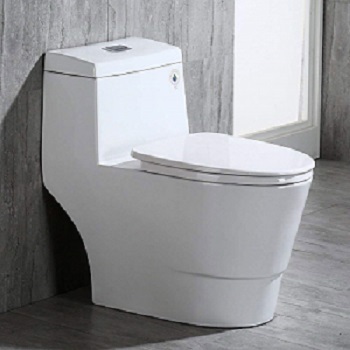 The WoodBridge T-0001, Dual flush toilet has a modern, sleek and minimal design that will fit perfectly in any space. 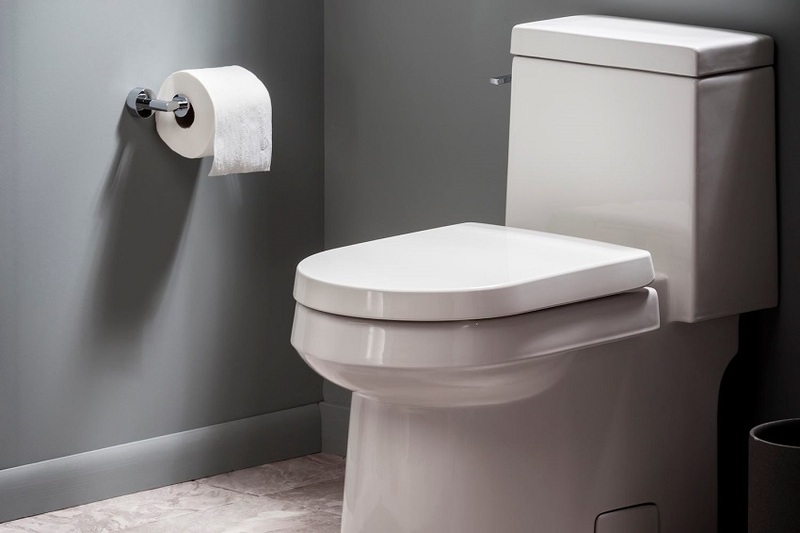 WoodBridge redesigned this piece by removing the conventional look of toilets, including a skirted trapway, which gets rid of grooves and crevices found on most standard toilets accentuating its minimalist design and making cleaning it very easy. Its internal build and quality also make it one of the most long-lasting and durable units. In addition, at only 18 inches from the floor, the unit offers a convenient height design making it a breeze for adults to sit as well as a stand. The dual flush mechanism on the other adds to its modern design appeal. It has two different buttons on the bowl each offering different gallons per flush depending on the nature of the waste. There is a 1.6 GPF and 1.0 GPF button meaning you won’t waste water on waste that does not require a lot of water. Also, the toilet is extremely quiet and will not leak or clog because of its siphon flush mechanism which features a glazed flushing system. Finalizing the list of external features of this piece is the soft closing seat. It is designed with a stainless steel hinge, which means it will serve you for several years and you can easily remove and reattach for cleaning from time to time. What about the installation process? The assembly comes with everything you need to install it completely. The soft closing seat, toilet, floor bolts, wax rings, and an installation guide. There is also a wrench tool for tightening bolts in hard to reach places easier Comes with a 1-year limited warranty on the closing seat and a 5-year limited warranty on porcelain parts. Installing it is a bit hard. You have to go through the manual several. Although this WoodBridge model doesn’t have the power of most high-end brands, its quality and design make it one of the best units on the market right now All at an affordable price tag. Manufactured by an established brand, the Toto UltraMax II offers almost everything a modern toilet can offer. It is designed with double cyclone technology which means a more powerful flush for cleaning and flushing out the waste with less water. Actually, it uses around 1.28 gallons per flush which is more than ideal and will save you hundreds of gallons of water in the long term. Also, the one piece unit gives you various options when it comes to color. You can go for Sedona beige, cotton white, colonial white, chrome or bone. They all look amazing. It is symmetrical, modern and will fit perfectly in any modern restroom space. The bowl is also SanaGloss coated to ensure nothing sticks on the sides of the bowl which means every flush will be a cleansing flush. Similarly, the bowl is elongated to ensure everyone who uses it feels comfortable. The seat height is 17.25 inches and the tank’s height is 28-3/8 inches. 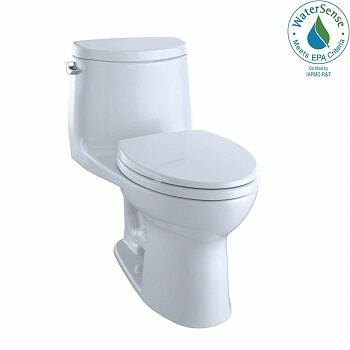 This unit is a highly efficient device that is ADA compliant with a high cleaning capacity while utilizing only 1.28 gallons of water per flush. Additionally, the SanaGloss finish will keep the unit clean for longer which means you will not have to clean it regularly. 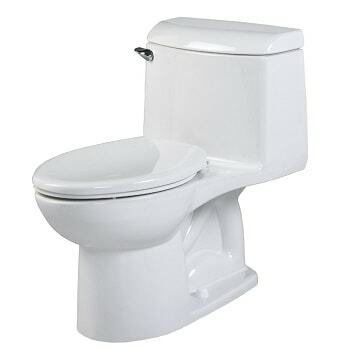 Available in linen or white colors, the American Standard Campion 4 is a full-sized toilet. It is slightly elongated for minimizing water consumption and its mirror-like ever clean surface means no stains, bacteria or mold. The piece can move larger masses than most standard toilets so you do not have to worry about it clogging or plugging easily. Its 2-3/8 inches trapway will also ensure it flushes completely, leaving nothing behind. The powerful and quiet toilet features a 4-inch piston action accelerator flush valve for a more powerful and faster flush. The seat is 16.5 inches in height which means it is ideal for use for most people even those with disabilities or arthritis. A bit noisy when flushing. Generally, this is a low maintenance yet highly efficient unit. The ever clean finish blended with a high-pressure flush allows it to clear even large waste with a single flush. Also, its resistance to all types of staining feature means you will clean it less frequently. All these features make the American Standard champion ideal for both business and home environments. Finding the ideal toilet for your needs can be quite challenging. The amount of data you need to comprehend concerning the different sizes, finishes, bowls, styles and flushing systems is enough to exasperate anyone. Hopefully, this guide has simplified this process. Honestly put, if you are looking for a quiet unit that doesn’t compromise on flushing effectiveness, these 3 units are your best bet. Outside their uniqueness, they still do an amazing job of handling all the main functions you would expect in a toilet, making them ideal for a wide array of households.